Hand #410: John Cynn raised to 8 million from the button and Tony Miles folded his big blind. Hand #411: Tony Miles raised to 9.5 million from the button and John Cynn folded his big blind. Hand #412: John Cynn limped his button and Tony Miles checked his option. The flop was , Miles checked, Cynn bet 5 million, and Miles folded. Hand #413: Tony Miles raised to 9.5 million from the button and John Cynn called from the big blind. They checked to the turn of an board where Cynn bet 12.5 million. MIles folded. Hand #406: John Cynn limped in and Tony Miles checked his option to see a flop of . Both players opted to check and the fell on the turn. Miles checked and Cynn made it 5 million to go, which Miles called. After the river, Miles checked and Cynn bet 9.5 million. Miles tossed in a single chip for the call and Cynn revealed the as the winning hand. Hand #407: Miles opened the action with a raise to 10 million and Cynn called. 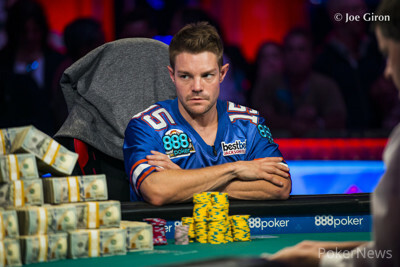 The flop fell and Cynn checked, prompting a continuation bet of 7 million by Miles. Cynn elected to fold and Miles claimed the pot. Hand #408: Cynn limped and Miles checked to a flop of . After a check by Miles, Cynn bet 4 million and forced a quick fold from his opponent. Hand #409: Miles made it 9 million to go and picked up a call from Cynn. 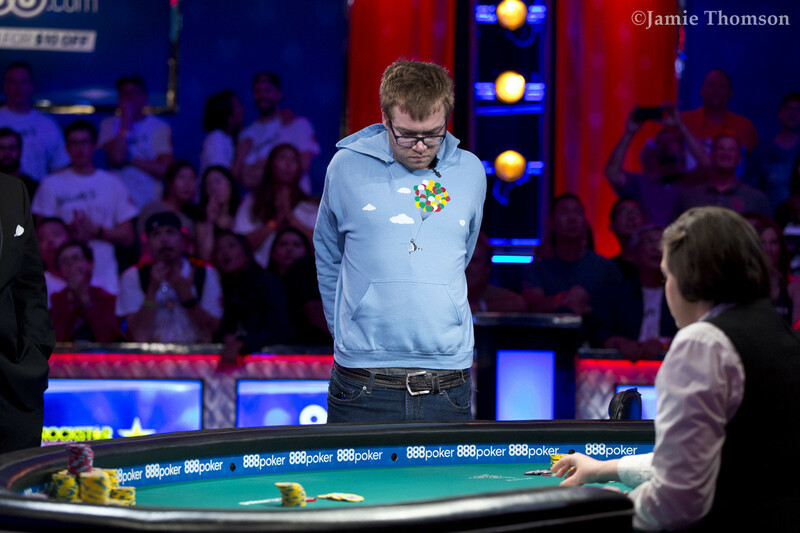 On the flop, Cynn checked over to Miles and faced a bet of 12 million. After spending two minutes in the think tank, Cynn check-raised to 32 million and Miles moved all in for 146 million. Cynn stood up from his chair and took one minute before calling. Miles was in a narrow lead but had to fade a lot of outs. The on the turn made a split pot very likely and, sure enough, the river paired the board to chop it up. 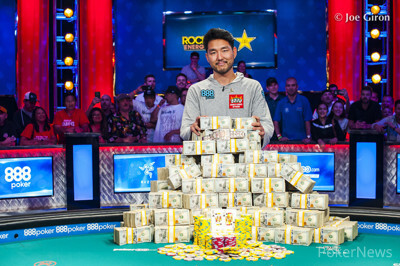 Hand #402: John Cynn made it 8 million and Tony Miles called. They checked to . Cynn won with a hand that wasn't shown. Hand #403: Miles raised to 11 million and Cynn mucked. Hand #404: Cynn raised to 8 million and Miles made it 24 million. Cynn called and flopped. Miles bet 16 million. Cynn called. The turn was the . Miles checked and Cynn thought a bit and checked back. The made it four to a flush and they checked. Cynn's triumphed over . Hand #405: Miles raised to 11 million. Cynn called. Cynn checked the flop and then folded to 15 million. Hand #400: John Cynn limped on the button, Tony Miles raised to 16 million from the big blind, and Cynn called. The flop came down , Miles continued for 8 million, and Cynn folded. Hand #401: Tony Miles raised to 12 million from the button and John Cynn called from the big blind. The flop was and Cynn checked to Miles who continued for 14 million. Cynn called, the turn fell, and both players checked. The river completed the board and Cynn led for 24 million. Miles called after a few moments, but mucked when Cynn tabled for queens full of tens. 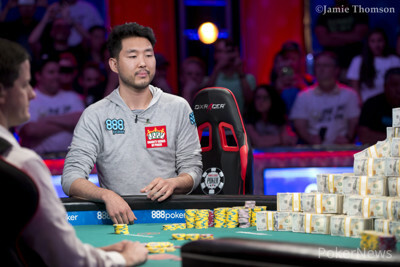 The final two players in the 2018 World Series of Poker Main Event have taken another short break. 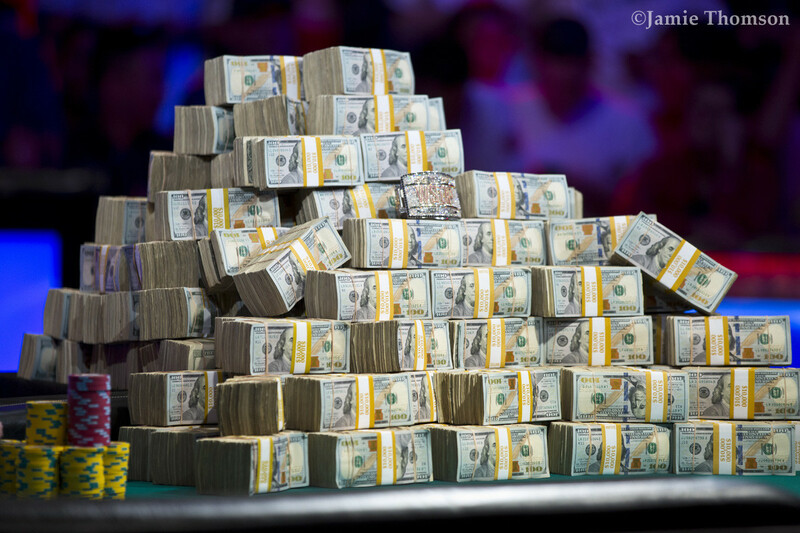 When play resumes, Tony Miles and John Cynn will continue their battle for $8.8 million and the most coveted bracelet in the game of poker. Hand #398: John Cynn limped from the button, Tony Miles raised to 12 million from the big blind, and Cynn called. The flop came down , Miles continued for 12 million, and Cynn called. The turn was the , Miles bet 22 million, and Cynn folded. Hand #399: Tony Miles raised to 8 million from the button and John Cynn called from the big blind. The flop came down and Cynn check-called 10 million from Miles. The turn was the , both checked. The river was the and Cynn bet 14.5 million. Miles mulled it over for a bit before he folded. 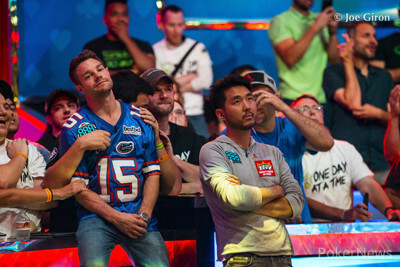 Hand #395: Tony Miles made it 8 million to go and John Cynn called to see a flop of , which both players opted to check. On the turn, Cynn checked and Miles made it 10 million to go. Cynn called and the on the river paired the board. Cynn checked and Miles bet 23 million. Cynn called and Miles turned over the for trip kings to take over the lead. 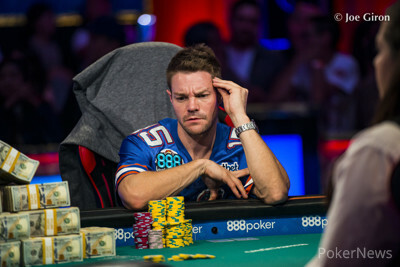 Hand #396: Cynn limped in and Miles checked his option from the big blind to see a flop of . Miles checked, Cynn bet 4 million, and Miles quickly sent his cards into the muck. Hand #397: Miles raised to 8 million and Cynn called. The flop came and a check by Cynn followed, Miles checked behind. The was checked by Cynn and he folded to a bet of 10 million by Miles. Hand #390: John Cynn completed and Tony Miles checked. They got to the turn for free and Cynn bet 4 million on to take it down. Hand #391: Cynn got a walk. Hand #392: Cynn completed, Miles made it 12 million, and the hand ended. Hand #393: Miles raised to 8 million and Cynn called. The flop came and Cynn check-called 5 million. They both checked the and the led to two more checks. Miles won it with . Hand #394: Cynn completed and Miles made it 12 million. Cynn called and flopped. Miles bet 12 million and Cynn continued. On the turn, Miles barreled for 21 million. Cynn released. Hand #385: Tony Miles raised to 8 million from the button and John Cynn called from the big blind. The flop came down and Cynn checked to Miles who bet 4 million. Cynn check-raised to 9.5 million and Miles folded. 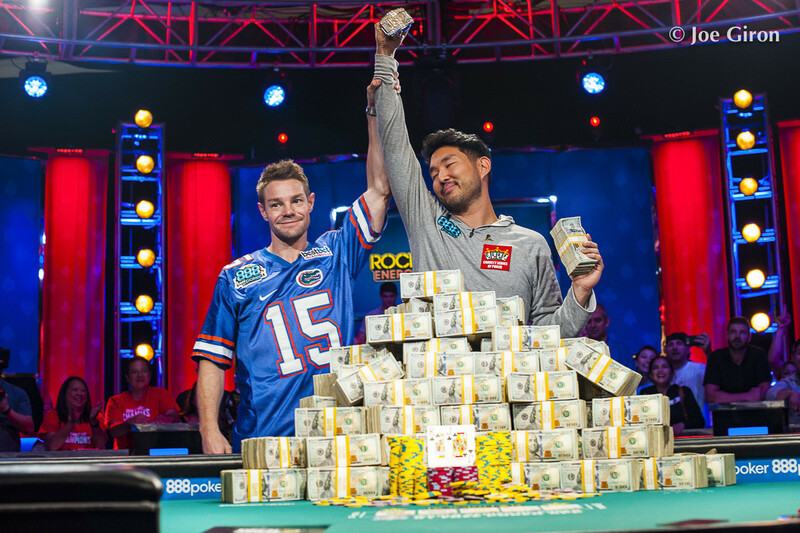 Hand #386: John Cynn raised to 6 million from the button and Tony Miles called from the big blind. The flop fell and Miles check-folded to Cynn's continuation bet of 6 million. Hand #387: Tony Miles raised to 8 million from the button and John Cynn called from the big blind. The flop was and Cynn checked to Miles who bet 10 million. Cynn folded, giving Miles the pot. Hand #388: John Cynn limped the button and Tony Miles checked his option. The flop came down , Miles checked, and Cynn bet 3.5 million. Miles called to see the turn and checked. Cynn bet 8.5 million and Miles folded. 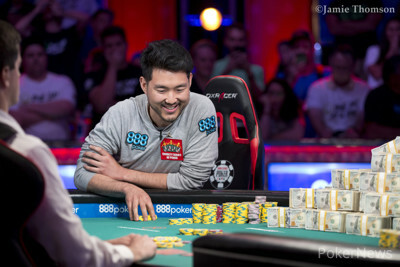 Hand #389: John Cynn received a walk in the big blind. Hand #383: Tony Miles raised to 8 million and John Cynn forfeited his big blind. Hand #384: Cynn made it 6 million and Miles called. The flop of went check, check, and the followed on the turn. Miles checked and Cynn bet 11 million to claim the pot without showdown right there. Hand #379: Tony Miles raised to 8 million from the button, John Cynn three-bet to 26 million from the big blind, Miles four-bet jammed for 163 million, and Cynn folded. Hand #380: John Cynn limped his button and Tony Miles checked his option. The flop came down , Miles led for 4 million, and Cynn called. The turn was the , both players checked, and the river completed the board. Miles bet 8 million, Cynn raised to 29 million, and Miles laid it down after about two minutes. Hand #381: Tony Miles opened to 8 million from the button, John Cynn three-bet to 25 million from the big blind, and Miles folded. Hand #382: John Cynn limped from the button, Tony Miles raised to 9 million from the big blind, and Cynn folded.